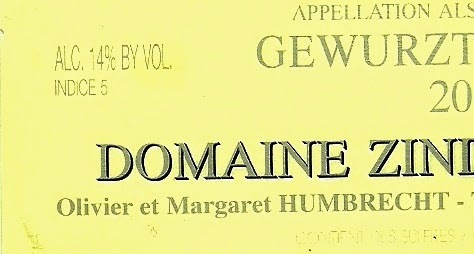 The Domaine came into existence through the merging of the Zind and Humbrecht families in 1959. But the Humbrecht family had been making wine since 1947 and growing grapes since 1620. Domaine Zind Humbrecht is currently run by Oliver Humbrecht, a Master of Wine and proponent of biodynamic viticulture. The Domaine, in Alsace, is one of the most respected and maintains numerous vineyards sites of various soil composition and climate – from granite hills to limestone based soil and other types, and produces various labels of Gewurz, Pinot Gris, Riesling and Muscat. Gewurztraminer has early bud break so it is susceptible to frost damage. But it grows best in cooler climates. It needs dry and warm summers but not too hot or the grapes won’t develop enough acidity to balance their naturally high sugar content and any resulting wine will be flabby. It does best in soil with mineral content and good drainage. I mention this not because I suspect you want to start planting these vines, but to help you appreciate the challenges of growing and making a good Gewurz. Domaine Zind Humbrecht’s vineyard for this 2011 vintage was on the coolest part of the Heimbourg vineyard. Vines averaged thirty years. The plot faces west so as to get a little less sunshine and where the marl-limestone soils are deepest and offer excellent drainage and steep slope. In the glass, this attention produces a wine of pale yellow, belaying the rich sweetness of the wine. Its nose offers floral notes and hints of kiwi, tropical fruit, rose water, lychee and passion fruit. Although more delicate than other vintages, allow the aromatics to warm up slightly and you’ll be treated as the wine opens in the glass. Spicy-sweet flavors dominate in a blend of these scents along with pear, citrus and ripe apple. The mouthfeel tends toward lush. BUT HOW CAN YOU TELL IF THE WINE IS DRY OR SWEET? THINGS SEEM TO KEEP CHANGING. I remember when the trend with German Rieslings was sweet. Now it’s Trocken (dry) and you can’t even find a Trockenbeerenauslese (which, despite inclusion of “trocken” in the word is very sweet). In Alsace, things moved differently. It used to be assumed that Alsace Rieslings and Gewürztraminers were dry, but since the 1990s, they have been trending sweet. 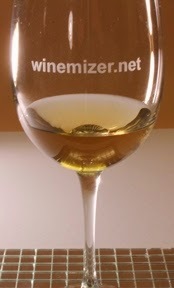 I’ve had dry Rieslings that were sweet and Gewurztraminers that were dry, others sweet and some in-between. alcohol levels, acidity and tannins. Acids promote sourness and working with tannins, counters sweetness. It matters too whether a wine is sparkling or not. Without going on and losing your interest, suffice to say a 5 on the Indice is a sweet wine. 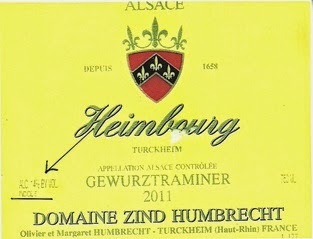 With Domaine Zind Humbrecht, you will see the code (Indice) listed in small print next to the alcohol level. Depending on the label, that may be on the right side or the left side. And with some producers, it may be nowhere. 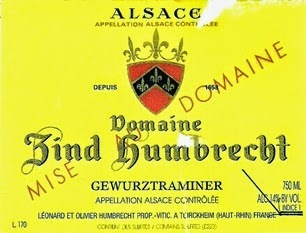 Trimbach, another excellent producer, does not use the Indice code. Personally, I find it helpful and wish it were universally adopted. 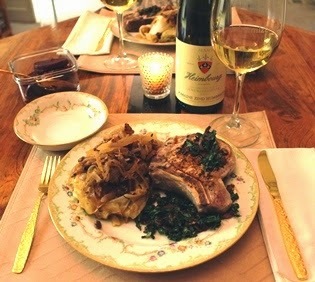 For one thing, although both dry and sweet Gewurztraminers have shared floral characteristics and flavors, some styles do better with particular foods. I prefer the dry style with spicy Asian or Indian foods. A slightly sweeter style might be better with an apple-cider infused cheese fondue or dim sum. A grilled cheese and slice apple sandwich on rye bread – what’s your preferred style? SO HOW SWEET IS SWEET? This wine (Heimbourg) has 57 grams of residual sugar per liter. Before you panic, remember that Chateau d’ Yquem may have between 100 and 150 g/L of residual sugar. A yummy Tokaji may come in at 450 g/L and occasionally go as high as 900 g/L. What matters is balance; balance with acidity keeping the wine from becoming cloying and therefore better served atop pancakes. Grapes like Chenin blanc and Riesling generally keep their acidity even at high ripeness levels which is why a Vouvray (Chenin blanc) might have a higher residual sugar content than your palette would believe. 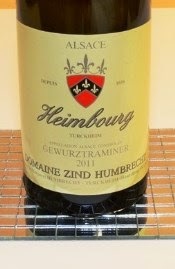 Nonetheless, this single vineyard Gewurz from Domaine Zind-Humbrecht is sweet. It’s also delicious with all the flavors in harmonious balance. It’s also the last year that the domaine will use this vineyard because wood disease is decimating the vines. I’ve enjoyed numerous Gewurztraminers over many decades and from different producers and made in different styles. Generally, I prefer a drier style. But a sweeter style, harmonious and in balance, is a treat and should be experienced. This wine, at $46 ARP, is higher priced than others of the same Domaine’s (dryer style for example. Not single vineyard). But then again, look at the price of many late harvest varietals; look at Sauternes, Tokaji, or a Beerenauslese. (see http://www.winemizer.net/2013/02/beerenauslese-and-trockenbeerenauslese.html for my blog on these wines). “Ice Wines” (which for me offer nowhere near the complexity) often cost more. Wine Spectator awarded this Gewurz 93 points. It also has terrific aging potential. Indice 2: Sweetness in not apparent on the palate. Indice 5: High Sweetness but without botytis (noble rot). Domaine Zind Humbrecht produces several styles of Gewurztraminer (see http://www.winemizer.net/2014/12/domaine-zind-humbrecht-gewurztraminer.html for my review of a dry style).